I am super excited today because Today’s guest is someone every online entrepreneur needs, but most don’t even know they do. He is a lawyer, but not any lawyer, he is an internet Lawyer to online businesses. Richard Chapo is a business lawyer in San Diego who has been practicing for 25 years. Richard advises small and large online businesses on how best to comply with laws such as the DMCA and FTC regulations applicable to conducting business online. Richard Chapo is a massive hockey fan and avid traveler having lived in such exotic locations as Siberia. How did you get started? Was it always your plan? When did you realize you wanted to be an internet lawyer? What is the most common case of online lawbreaking? copyright and trademarking, is that something you do? Do online business owners need insurance? what kind of insurance? Buying an online business, what do I need to know? Have you worked with any amazon sellers yet? 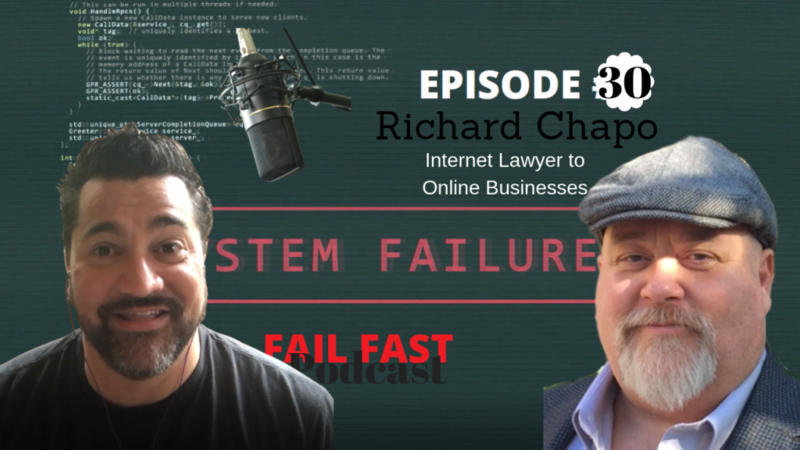 As an internet lawyer, Richard Chapo do you just need to know the law or do you also need to have a deep understanding of web development coding, e-commerce, etc? Everyone has heard of GDPR, do you think most online entrepreneurs are aware of what it means? If an online business has 2 or more founders what do they need to have as contracts? Entity formation, we all hear advice about forming an LLC in Delaware, is that legit advice? Terms of service and privacy at the bottom of our websites, is it mandatory? Richard Chapo can be reached through his website SoCalInternetLawyer.com.